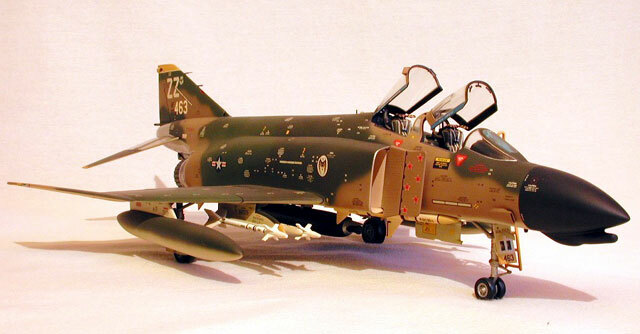 This is Monogram’s initial issue of their ubiquitous 1/48 scale Phantom II kit. 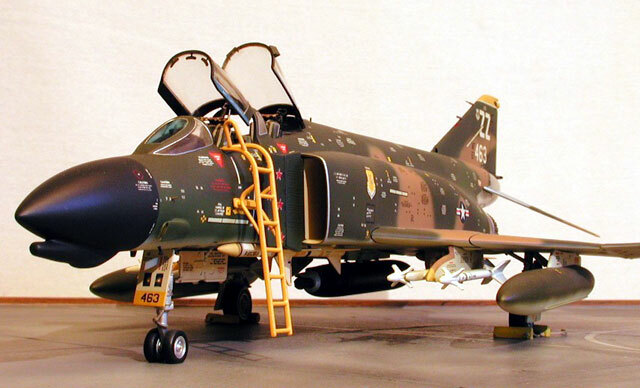 I built this model when it was first released late in 1979, converting it to an F-4J and finishing it in the multi-toned gray ‘Ferris’ scheme. 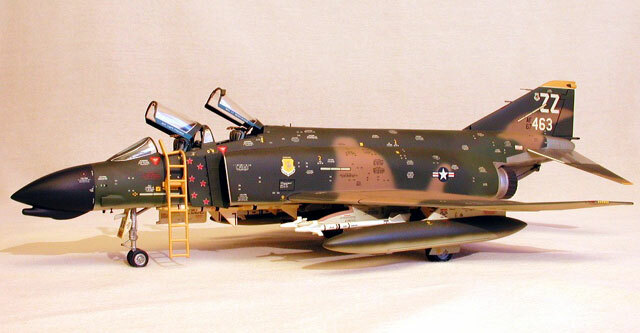 After a couple of years, I tired of looking at it and rebuilt it as a standard Air Force F-4D wearing “Happy Hooligans” markings in overall ADC Interceptor Gray. 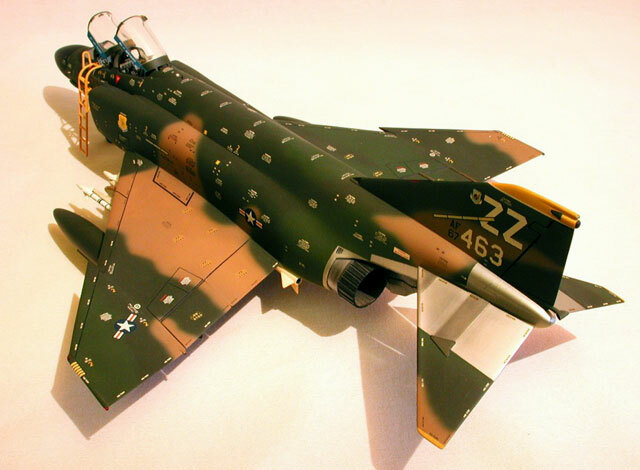 Still not satisfied, the model was repainted several years later to depict 66-7463, the aircraft used by Steve Ritchie and Chuck DeBellevue to become the USAF’s first aces of the Vietnam War, as it appeared in 1980 while assigned to the 44th TFS, 18th TFW and based on Okinawa. The weakest feature of this kit are the intake ducts, with an assembly seam bisecting the prominent BLC vents on the top corners of the ducts. I corrected this by sectioning in a new set of louvers taken from a spare lower wing, using CA to bond and blend these new pieces to the existing structure. The tailpipes lack any internal structure so I installed the afterburner inserts from the Testor’s/Italieri RF-4C to give them some depth and detail. Colored Lexan was use to fashion the various exterior lights on the fin and the wingtips, while a new fuel dump mast was fabricated from aluminum tubing and bonded to the base of the fin with Crazy Glue. The ordnance is mostly from the kit, though extensively detailed. I made a new muzzle assembly for the SUU-23A gunpod, using #20 hypodermic needles. The Aero 27A pylon for it received a set of sway braces made from strips of sheet aluminum with short lengths of straight pins for the casing nuts. 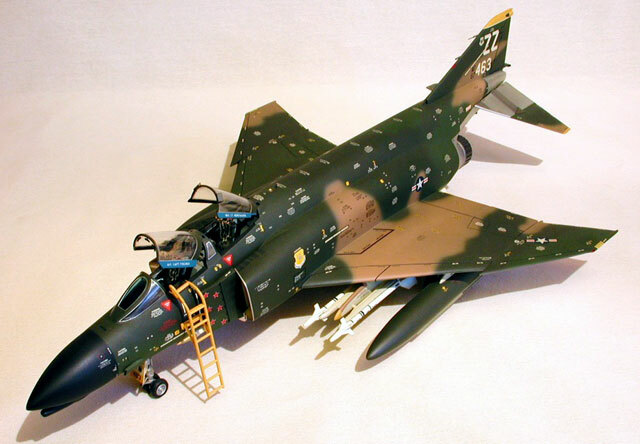 I used the AIM-9J Sidewinders from the F-104G Starfighter kit after modifying the steering fins, then corrected the Aero 3B launch rails using aluminum tubing for the mounts. The AIM-7E Sparrows were cleaned up and detailed with rocket motors at the rear. The cockpit was assembled and installed after adding throttles to both stations and a sun shroud for the WSO’s radar screen. Scratch-built actuators were added to both canopies and I used some Model Technologies photo-etched mirrors to complete the interior. I modified the main landing gears struts to have the characteristic forward cant, which allowed the bottoms of the main doors to be attached parallel to the ground plane, an oversight among most of the available Phantom kits. MV lenses were used to replicate the landing/taxi lights on the nose gear door and as fuselage lights under the intakes and on the dorsal side of the fuselage. 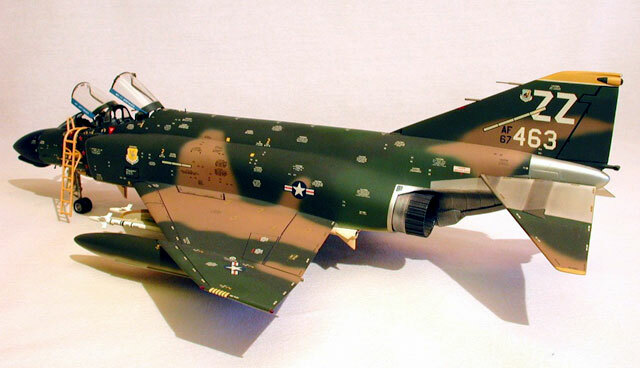 The model was painted in the modified four-color SEA scheme (tan area reduced by 15%) using Model Master enamels, after increasing the contrast between the greens. Spray ‘n’ Plate (now part of the Testor’s line) was used on the bare-metal areas of the aft fuselage, tinted with powdered graphite to represent the different types of metal. Testor’s Glosscote was used as a decal primer and the model was marked using several different MicroScale, SuperScale, and ScaleMaster sheets. A photo essay appearing in an old Koku-Fan was used as reference, and when the decaling was complete Testor’s Dullcote was used to seal the finish.